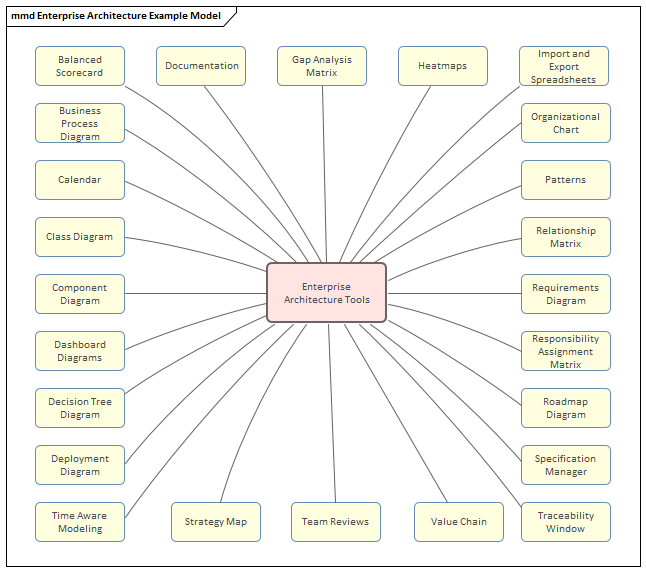 Enterprise Architect is a sophisticated and flexible Enterprise Architecture platform that can be used as both an architecture repository and a tool for managing architecture projects. It can be used across the entire life cycle from setting up an architecture program or office to planning, managing, developing and documenting architectures through to the governance of implementation projects that consume the architectural output. The tool can be used with any single or combination of Architecture Frameworks, processes and languages of representation. There is a wide range of facilities and tools that allow the architect to work using their preferred methods such as Word Processor views, Spreadsheet views, Diagrams, Relationship Matrices or a range of other core and extended features. This Mind Map shows the landscape of the key Enterprise Architecture tools that can be used to set up and maintain the architecture office and to plan, create, manage and document architectures. While these are the primary tools there are a series of other tools described in the topic Additional Enterprise Architecture Tools.